President Hamilton kicked off the day by challenging all of us to think of the Summit as an annual event. After his address, Len Peters, NYU IT CIO, welcomed attendees to the Tech Summit in an at-capacity Kimmel auditorium. He introduced the keynote speaker, Dr. Yann LeCun, highlighting his many impressive accomplishments in artificial intelligence research and other areas of expertise at NYU, Facebook, and beyond. A number of sessions were scheduled throughout the day. These sessions, each of which was part of a larger thematic track, explored various topics related to IT in an academic and research environment. Some of the highlights are below. 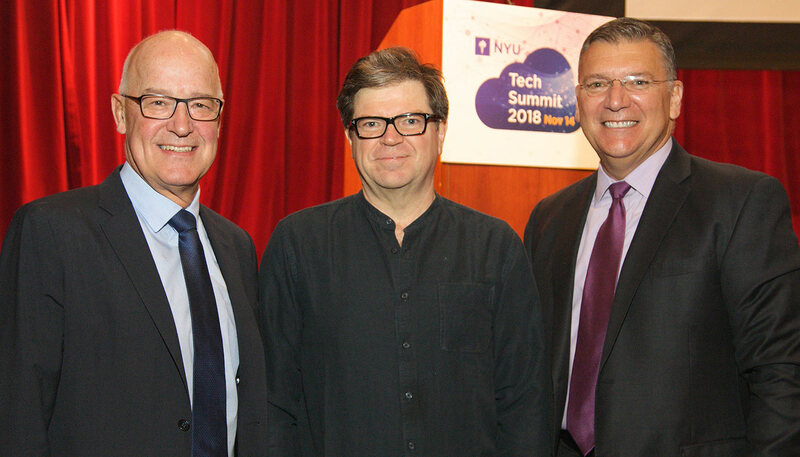 NYU President Andy Hamilton, keynote speaker Yann LeCun, and NYU CIO Len Peters. Three Gallatin faculty spoke about how their classes incorporate technology into the humanities in diverse ways. Cyd Cipolla discussed her class that combines lab work with feminist theory, coding, and physical computing. Eugenia Kisin spoke about her digital curatorial projects. Lisa Daily talked about the “empathy arms race” in relation to analyzing news coverage that focuses on individuals with little contextualization. This presentation explored effective designer and developer collaboration and the synergetic methods that have worked for the OTSS team throughout the past few years. The topics in the presentation included successful approaches to understanding and implementing user experience in both design and development, and the steps required to prove and validate concepts through visual workflows. Bizzaro and Potter discussed their team’s strategies for crafting and delivering personalized, targeted email communications that helped boost the response rate with students attending Stern’s Undergraduate College, and the internal processes they put in place to increase their marketing success. Him explained the features of Story Maps and demonstrated the easy-to-use software, which is free for NYU faculty and staff. Story Maps let you combine authoritative maps with narrative text, images, and multimedia content. They make it easy to harness the power of maps and geography to tell a story. Kitty Bridges, NYU IT AVP of Digital Accessibility and IT Policy/Compliance NYU IT. This workshop for content creators outlined the basics of digital accessibility and how to make accessible content. It emphasized the importance of starting with an accessible source file, using built-in tools in some software that can check for accessibility, and other tools to help with document conversions. For further information see the workshop slides, the Digital Accessibility website, or email digital-accessibility@nyu.edu. Databrary – a searchable, secure, large-scale storage for sharing videos and data with authorized users, that has 429 institutions contributing videos. Data VYU – includes a video player, controller, and spreadsheet that categorize types of behavior and movement, time-locked to the video. PLAY (Play and Learning Across a Year) – video documentation of infants and caregivers in their homes. This is Big Data of human behavior and NYU is a leader using video in behavioral research. Read more about this research and tools NYU has developed in the August 2018 press release. 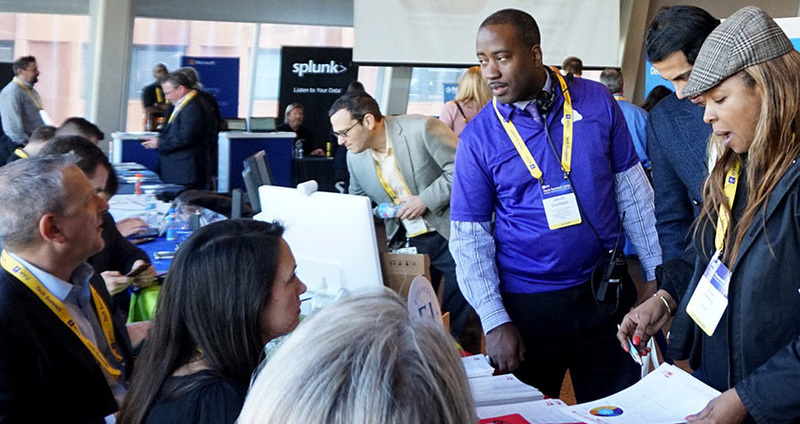 This interactive workshop focused on sensor data alerts for Real-Time Internet of Things (IoT), the network of devices connected via the Internet. Highlights included a discussion on industry tipping points — that is, key IT technologies like Artificial Intelligence, Machine Learning, the need to access data in real-time, streaming API’s, and a live demo of IoT sensor alerts processed through the NYU IT API/Data Portal. 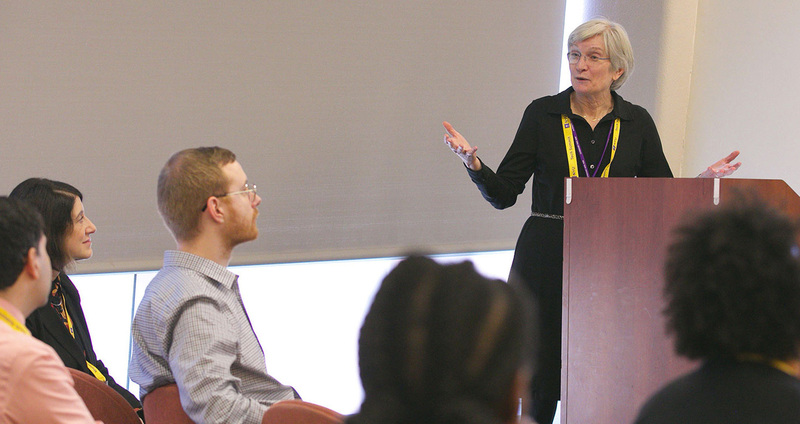 This session discussed a collaboration between the NYU Langone Orthopedic Hospital and NYU IT Research Technology. This collaboration produced 3D-printed cutting tools and artificial parts for knee-replacement surgery designed by the Laboratory for Orthopedic Implant Design and 3D printed by the LaGuardia Studio. 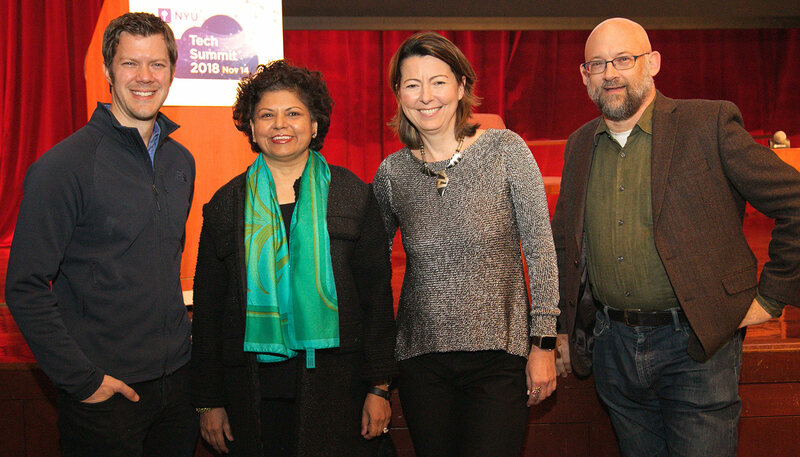 Technology Summit Closing Plenary speakers: Robyn Peterson, Chandrika Tandon, Jelena Kovačević, and Clay Shirky. The day concluded with a plenary session moderated by Clay Shirky, and featured Chandrika Tandon, Jelena Kovačević, and Robyn Peterson. Their wide-ranging discussion touched on topics such as whether artificial intelligence is overrated, and ways to consider the value that technology brings to education. Len Peters closed the Tech Summit with a few words in praise of the spirit and scope of the event, reflecting on how it highlighted IT’s unique ability to connect the many disparate parts that make up the NYU community. For additional photos, please visit the NYU Technology Summit website.